Yesterday was a very exciting day, Pure Barre opened in Buffalo, NY! I just got back from training at their corporate location in Spartanburg, South Carolina. I am so thrilled to be a part of such an amazing team of girls and awesome company. After an amazing and challenging class, to my disappointment I looked outside and witnessed the first snowfall of the season. I knew warm carbs aka comfort food for dinner was a must, so I whipped up this yummy dish. Hope you all enjoy! *I recently read an article about the harmful effect of canned tomatoes. It said that the liner of the cans have BPA, and since tomatoes are acidic the BPA goes directly into them, which can cause obesity, diabetes, heart disease and can cause issues with the reproductive system. 1. Start by taking a medium sized skillet and add the olive oil and onions over medium heat, cook for about 7-10 minutes stirring frequently. Add the garlic and Italian seasoning paste and let simmer for 3 minutes, add the beans (rinse them first), tomatoes, and pepper. Let simmer on low for about 10 minutes. 2. 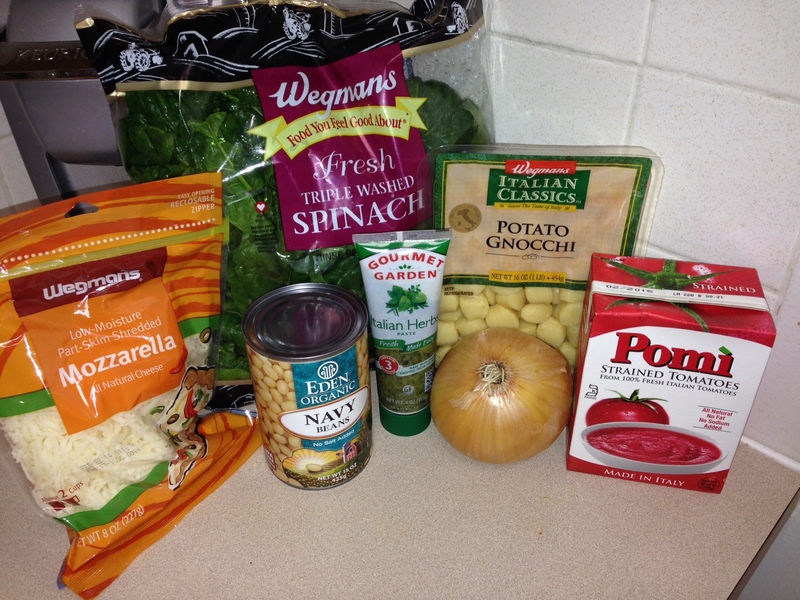 In the meantime, prepare the gnocchi according to the directions on the package (until they are floating) and drain. 3. 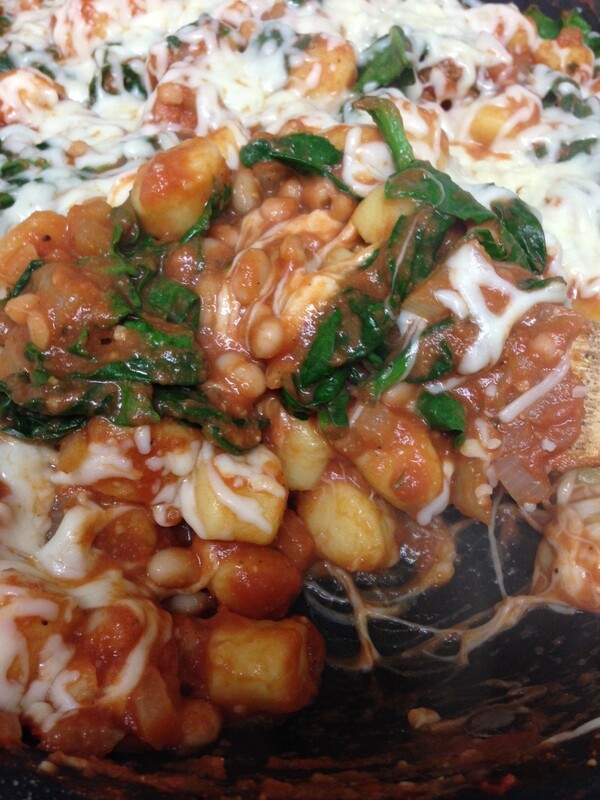 Add the spinach, let it wilt, then add gnocchi. 4. Stir in the Parmesan and sprinkle a thin layer of mozzarella cheese on top. 5. Place your pan into the oven on high broil for about 2 minutes (or until the cheese has melted), serve and sprinkle with crushed reds!